We both laughed at that. I always found it amusing that my Mom, who could speak anywhere on any topic, always sat with a pen and a notebook to note down points. She believed that failing to plan was planning to fail. Confidence, she had. Over-confidence, no. So, a few minutes later, she had her notes ready. Nobody could say she didn’t have a sense of humor. What was the occasion for this conversation? 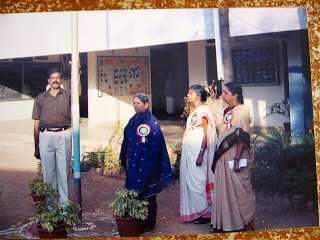 My Mom was invited as the Chief Guest of Honor for the Republic Day Celebrations at Vidur’s school on January 26, 2006. 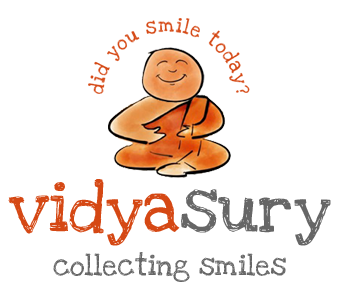 Vidur was in the third Grade at the time. We were very excited, of course and were all looking forward to hanging on to her every word. Finally, the day dawned bright, clear and slightly chilly. Naturally, Mom did not wear what she planned to, because her little pet Vidur insisted that she wear a deep blue silk saree instead and of course she agreed. We set out to school, with Vidur in crisp whites. There, she was ushered to the Principal’s office by a guard of honor. 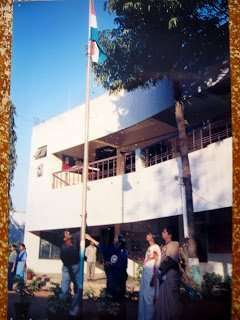 When itwas time, School assembled, and it was time for the flag hoisting. Then everyone stood at attention to sing the National Anthem. After that, we proceeded towards the stage, where Mom was to deliver her speech. Here it is – I hope you are inspired as much as I am. On Republic Day regional identity gives way to national identity. Neither caste, creed nor religion matter. What is predominant is the Indianness of the people. India can become a developed nation only if everyone contributes to the best of his or her ability and capacity. All the best to you, children….Thank you. This is one of the nicest speeches I’ve ever heard, and she got a standing ovation. 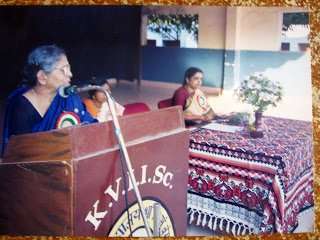 Everyone enjoyed it because most of the children knew her as a regular visitor to the school as Vidur’s Grandmother. After the speech there was a cultural program followed by tea with the Principal. In the course of conversation, Mom was invited to teach at the school for 3 months, as one of the teachers had to go on leave. She accepted and had three hectic months doing what she does best, and loved to do – being a teacher. I am always stunned at how she managed those three months, while being on heavy medication and a renal diet along with all her health issues. She had chronic insterstitial lung disease and CKD. Yet, she was the most cheerful person to have around. I have so many wonderful memories of my Mother, my mentor and best friend. I am sad to say that she passed away on Feb 8, 2010 after being rushed to the hospital with a collapsed lung that never recovered, causing internal sepsis. She was on full life support for five days before her heart just stopped functioning. She was 64. Her love lives. Her students still remember her. We miss her. Very much. On a daily basis. There are many versions of India’ s National Anthem, but this one has to be my favorite. This was so lovely! I have tears. Happy birthday India! What a lovely trek down memory lane! What a lovely day. Happy birthday to India! Happy Republic Day Vidya, proud to be Indians – aren’t we! That silent National Anthem has always moved my heart right from the time I saw it- touching indeed. Beautiful Vidya. Mum’s are so precious and yours sounds wonderful. Elle recently posted…Are You Using Your Creative Success Mechanism? This was a beautiful tribute to India and to your mother. No wonder you miss her. What a lady and so young. Too young to die!! She was 9 years younger than my mom. PS I smiled a lot today! Carolyn Hughes recently posted…Why did you leave? I’m so happy India is free and I celebrate its birthday with you. Thank you for sharing so deeply from your memories and from your heart. Lovely post Vidya. Brought back memories of Republic and Independence Day during my school days in Mumbai. Rabindranath Tagore’s poem is one of my favourites. My late father and I often recited together. Thanks for sharing a great speech and wish you a belated happy republic day! Between your mother’s speech and the anthem I can’t help but to smile. Simply beautiful. I’m familiar with your national anthem, but love the silent Indian national anthem here 🙂 That’s touching. Your mother is one you can really proud of dear 🙂 I can think of mine right now too. She’s not confident enough for a speech though 🙂 I have no words, but we are really lucky to have such wonderful mothers. Once I had a teacher and feels similar to your mother 🙂 She’s caring and inspirational too. The speech of your mother (Still you have that note?) 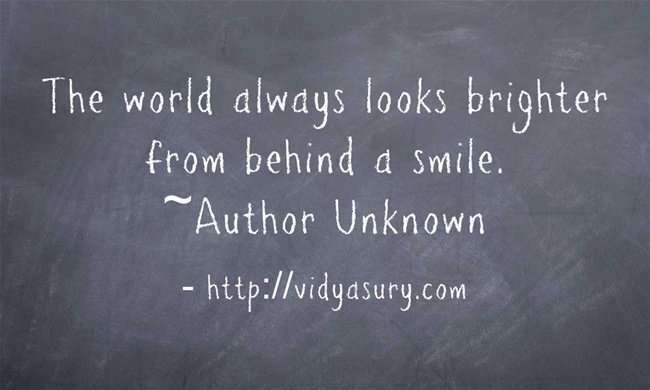 reminds me of great leaders in the World and recently I’ve read about Abraham Lincoln too. 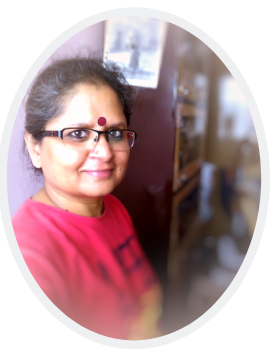 Mayura recently posted…Do You Call Yourself a "Blogger"? Jodi @ Heal Now recently posted…Goodbye, Fear. Good Riddance. Aditya recently posted…Inspiration: Butterflies or Dragons? What a lovely post, Vidya. Such lovely thoughts. I’m sure, your mother is as proud of you, as you were of her. I can believe everything you say about your mom because of what I know of you. She must have been amazing because you are. Thanks for sharing some of her with us.